Recommendation: If you like crime plots and follow closely how day-in and day-out law enforcement personnel solve a case along with tinge of romance and a boat load of twists that spin the plot like a top, then this is a perfect series to read through. 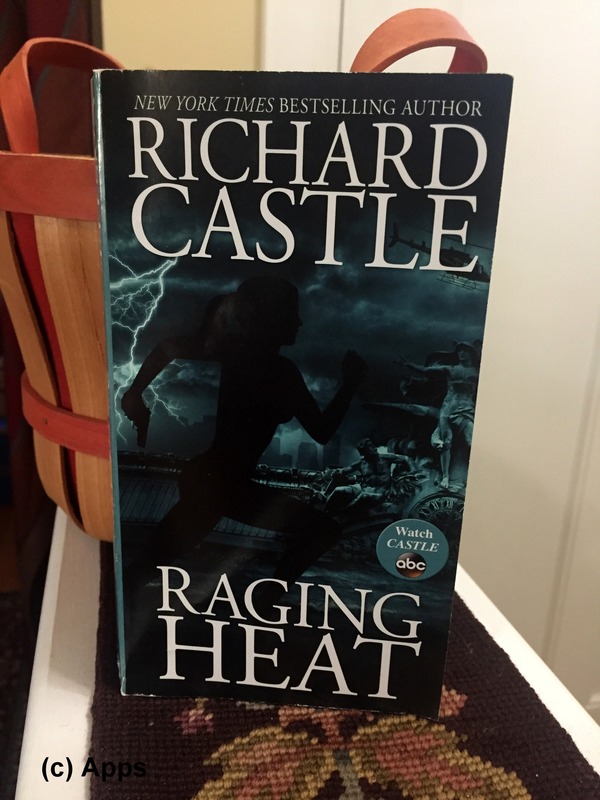 Raging Heat is the sixth book in the series of Castle Books written by fictional author Richard Castle from the TV series Castle (portrayed by Nathan Fillion) published in September of 2014. The book is released right before Season VII of the TV show Castle (My review of the TV series here) aired for the first time. The plot is set two years after the previous book Deadly Heat (My review of the book here). Richard Castle balances very well the job tensions and relationship strains between Nikki Heat and Jameson Rook. The plot definitely is set during a time when the whole of eastern coast of US was bracing itself from the onslaught of Hurricane Sandy. The elemental feelings of human beings when faced with the force of Mother Nature are drilled down to its bare necessity by Castle. Again I feel that the chemistry is there, yet the romance part of the plot between Jameson and Nikki sometimes comes out as very basic. With other romance writers I always felt the romance part between the characters as a natural segue. However with Nikki and Jameson it always felt staged and basic. Perhaps it is because these characters are based in the TV show Castle characters or perhaps it is because reader knows that they are acting a scene. Whatever the reason the romance part always threw me off in Nikki Heat books. The ending could have been a bit different but it was not too far from what I had guessed considering the route that Nikki’s investigation was going. It did pale a bit compared to the previous two books. Also Castle has some scenes that reflect directly on Season VII of the TV show, albeit a bit modified. All in all another good book for those lazy days that will not disappoint you. However this time around it doesn’t excite you much either, just a plain read. PS: Don’t miss to read the acknowledgement section. If not the book, this section will definitely tickle you. 1) It’s still a mystery as to who wrote truly wrote these books. Obviously not the fictional character Richard Castle or Nathan Fillion the actor who portrayed the role. Unlike Murder, She Wrote books (Check my reviews of this series here, the actual author of these books is really hidden deep. 2) Nikki Heat and Jameson Rook while finding clues for their case in Beckett’s Neck in East Hampton, meet an author. Castle doesn’t give any real name but generic description. I tried to piece it together to see who would that be but failed. The closest I came to was he could be perhaps James Lee Burke. However he could be any of the authors that had appeared in the Nikki Heat books or the TV show Castle. a. On Pg. 11, para 7 line 2, there is a repetition of the words “per second”. b. On Pg. 19, line starting “Oh, right. You know…” – it should read “the noble Crown Victoria from its fleet…”. Instead there is a “the” between “from” and “its” that is not required. c. On Pg. 72, para 4, a scatter of quotes around the text is seen, haphazardly placed. d. On Pg. 270, para 1, the way author writes about the incident around Captain Wally “Iron” Gates’ injury looks like he survived. However on page 273, in a conversation between Zach “The Hammer” Hammer and Nikki Heat, it is revealed that Captain Iron Gates had indeed succumbed to his injuries and died in that fata blast that occurred three pages earlier. Was it an error by the author or the proofreader missed it? It is a definite flaw in the plot. f. On Pg. 349, last para, an additional “her” is inserted between “wholeheartedly” and “for all” in the line “Nikki thanked her wholeheartedly…”.